Joan H. Collins, 91, died peacefully on March 10, 2019, in Baltimore, Md., with her family at her bedside. Born on September 1, 1927 in Forest Hills, N.Y. to Joseph and Grace Higgins, she was in the first graduating class at the Greenwich campus of Convent of the Sacred Heart in 1946. She went on to earn an undergraduate degree in English from Manhattanville College in 1950. After receiving a Master of Teaching degree in 1978, she taught English and History at School of the Holy Child in Rye for ten years, and History at St. Mary’s School in Greenwich until she retired in 1992. Joan Higgins married Paul D. Collins on June 28, 1952 in St. Patrick’s Cathedral, New York City. They lived first in Stuyvesant Town in New York City before moving to Eastchester in 1956 and then on to Rye in 1964 as their family grew. In the early 1990s, the Collinses moved to Ponte Vedra Beach, Fla., joining many of their friends from Rye, and making many new friends. Mrs. Collins picked up right where she left off, with a social calendar that would exhaust most, and enjoyed all that her new community had to offer, including golf, the ocean, and cultural events. 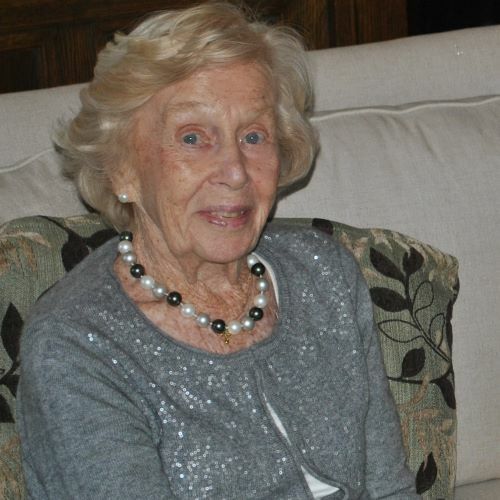 She was active in the community, volunteering for Meals on Wheels and at the Ponte Vedra Library. She served in multiple capacities at Our Lady Star of the Sea in Ponte Vedra Beach. Her faith and social calendar took a backseat, however, to her love for and devotion to her children, grandchildren, and great-grandchildren. Neither she nor her husband ever missed a graduation, Holy Communion, Confirmation, or wedding. Joan Collins is survived by her six children: Paul Jr.; Candy Walsh (Tim), John (Monica), Stephen, Joan Mueller (Scott), and Kate Barron (Rob); as well as 17 grandchildren; and five great-grandchildren. She was preceded in death by her beloved husband of 60 years, Paul D. Collins, and two brothers, Joseph Jr. and James Higgins. A Mass of Life & Celebration will be held at Resurrection Church in Rye on Saturday, March 30 at 11 a.m., followed by interment at Woodlawn Cemetery, in the Bronx. Donations in Joan Collins’ memory may be made to Friends of the Ponte Vedra Beach Library, P.O. Box 744, Ponte Vedra Beach, FL 32004.